If you’ve written a nonfiction business book and are looking for a publisher for your manuscript, here is a list of business book publishers accepting submissions. If you want to make a submission through a literary agent instead, take a look at the following 19 top literary agents for business books. Jessica Faust founded Bookends Literary Agency in 1999 to fulfill her dream of working with authors and writers. As an editor, columnist and subsequently a literary agent, she is familiar with all aspects of publishing. Her experience from different angles of the industry allows her to assist authors in their times of need. Jessica’s focus remains on flourishing relationships and not just getting authors their first contract. Currently she is seeking business and personal development books, women’s fiction, dark stories, suspense, thrillers, psychological thrillers, literary fiction, mystery and self-help. To query Jessica, use the online submission form and contact her. Buyer, editor and now literary agent at FinePrint Literary Management, Laura Wood knows what she’s doing. Having worked with prestigious publishing houses and companies, Laura knows the intricacies of being an author. She likes to work with debut and first time authors and teach them the ropes of this world. She prefers working with experienced professionals in terms of non-fiction such as entrepreneurs, businessmen, scientists, professors, physicists, journalists and teachers. Laura is looking science fiction, mystery, business, history and non-fiction. Send a query letter and bio pasted in the body of an email to Laura. Do not send any attachments. Since 2010, John Rudolph has been a literary agent at Dystel, Goderich & Bourret LLC. An editorial assistant and eventually a children’s book editor, he realized he likes the connecting with authors and supporting them. He wants to focus on the big picture and that’s why he became a literary agent. John prefers clear, crisp writing and communication. His focus has been to build a client list that maintains a balance between children’s books and adult fiction and non-fiction. While it’s an eclectic list, his preferred genres remain middle grade fiction, science fiction, young adult fiction, illustrated children’s books, narrative non-fiction, memoir, health, military history, business, sports and music. Send a non-fiction proposal via email to John after reading the guidelines. Specializing in non-fiction, Lisa DiMona is a literary agent at Writer’s House. Specialists of their field such as entrepreneurs, businessmen, scientists may need support and guiding penning their journeys down. Lisa loves working with these professionals and enabling them to create a bestseller or an award winning book. Authors who have embarked on a mission or have a goal in their lives interest her. She wants authors and writers of creative non-fiction, memoir, culture, art, business, how-to and entrepreneurship. Send a query letter to Lisa via email explaining why your book will have readers care about it and the topic. Founder and literary agent at Meredith Bernstein Literary Agency, Meredith has been an agent for 30 years. A good literary agent ensures the writer gets the right team for editing, designing, publishing and marketing. Debut and amateur writers may need more hand holding and guidance which big agencies may not be able to provide. Meredith offers one on one support, counseling, advice and tips that come in handy for the authors. She is seeking authors and writers of young adult fiction, mystery, romance, commercial fiction, women’s fiction, business, travel, spirituality, memoir, health, medicine, parenting and thrillers. Send a one page query letter, table of contents and your resume. Use the online contact form to submit your materials. Now at Harvey Klinger Inc, Andrea Somberg is always seeking new clients. A literary agent for nearly 15 years, she is familiar with the constantly changing landscape of the publishing world. Based in New York, she likes working with new and fresh authors. Their enthusiasm and willingness to creatively collaborate makes for great partnerships. Her clients have won awards and nominations for their work and writing. She is also a teacher and passes on effective skills to her students and writers. Andrea is looking for literary fiction, women’s fiction, romance, mystery, fantasy, young adult, science fiction, historical fiction, narrative non-fiction, memoir, how-to, lifestyle, travel, interior design, business, self-help and popular culture. Email your query letter along with the first 5 pages of the project pasted in the body of the email. President of the David Black Agency, David has been running the business since 1990. Prior to that he was an agent at Sanford Greenburger for nearly 5 years. In his 2 decades of work experience, he has worked with several authors and led them to the top of bestselling lists. He is a keen and sharp negotiator and wants the best for his clients. Despite being a founder and handling the agency, his commitment to authors has never wavered. You will find personalized attention and support if you work with David. His focus remains in non-fiction and genres such as narrative non-fiction, politics, memoirs, business, fitness, sports and history. Read the submission guidelines specified here. Please note they are accepting submissions only via post. Moses Cardona is a literary agent at John Hawkins & Associates. The President of one of the oldest literary agencies in the country, he has been in the business since 28 years. Having represented multiple international and national bestselling authors, he is an expert negotiator and salesperson. His interested and favored genres include non-fiction, multi-cultural fiction, science, business and suspense. Read the submission guidelines before sending your query via email. An agent at Curtis Brown Ltd since 2015, Tess is also the Social Media Director there. Curtis Brown is one of the country’s most prolific agencies and as such Tess gets to represent some really great authors. Being a relatively new literary agent means her enthusiasm for new authors, writers and their writing is high. She is willing to work with completely new and previously unpublished faces and names. Tess is trying to acquire young adult fiction, women’s fiction, mysteries, romance, non-fiction, popular culture, business, humor, biography and self-help. Write a query letter via email describing your project. A researcher and founder of a web design company; Roz became a literary agent in 2013. Her love for literature led her to joining Sandra Dijkstra Literary Agency. A writing teacher, she applies the same skill to her job as an agent. Writers need help and aid in fine tuning their work, finding editors and publishers or even finding their voice. Roz excels at all those things and revels in her job. She wants to find exciting new voices that are bringing radical ideas and changes in their field or industry. Genres she is acquiring include fiction, thriller, contemporary fiction, science fiction, non-fiction, business, memoirs, cultural studies, design and urban studies. Read the submission guidelines carefully before sending your proposal via email. Frank founded The Literary Group in 1986 to provide writers and authors the literary support they desperately needed. In 2013, he merged his company with Folio Literary Management. As a literary agent at Folio he loves working with people who are passionate and invested in their work. A writer’s true gift remains his ability to make something simple sound fascinating. And that’s what Frank has helped multiple authors and writers do over the decades. Celebrities, self-help gurus, businessmen and entrepreneurs come to him to share their story and trace their journey. He doesn’t limit himself to one genre and will accept any topic as long as it thrills the reader. Yet some genres that are certain to tickle his fancy include sports, lifestyle, health, mind, spirituality, business, memoirs, military, biography, finance and humor. Previous clients have included names such as Kareem Abdul-Jabbar, Terry Bradshaw, Donald Driver and Maria Menounos. Paste the first 10 pages of your manuscript and a query letter in the body of an email. Write ‘QUERY’ in the subject line of the email. Since 1996, Deidre Knight has been a literary agent and President at The Knight Agency. A shrewd salesperson and negotiator, she can help her authors and writers get contracts with top publishing houses. A good literary agent knows how to maintain relationships in this fickle industry. Deidre will gather and rally the required support and a stellar team you need to get your book to the finish line. She will be your fiercest critic and most loyal supporter. Her authors have worked with the biggest publishing companies and continue to receive praise for their work. With a staggering 800 titles under her belt, she is still looking for women’s fiction, commercial fiction, historical fiction, young adult fiction, middle grade fiction, thrillers, business, investing, gardening, popular culture and personal development. Use the Query Manager to submit a query to Deidre. Owner and literary agent at Ted Weinstein Literary Management, Ted has been running it since 2001. He has worked several profiles including writing novels and being a music critic. The personal experience of being an author has familiarized him with the struggles of writers and authors. His personalized attention and touch allows his clients to feel cherished and respected. For a new writer, having an agent who gives them his complete time and concern is a great experience. He only represents non-fiction currently. The genres of his choice are history, biography, current affairs, politics, business and popular culture. Read the submission guidelines carefully and use the online form to send a query. Lorin Rees is a literary agent at The Rees Literary Agency. He wants to take your raw, rough ideas and finesse them. A lot of writers feel pressured to approach agents with incomplete ideas. Lorin will sit with you and brainstorm if he believes in you and your project. Going beyond the traditional and conventional agent-writer relationship, he will be there from the start to finish for you. He is currently seeking literary fiction, non-fiction, business, memoirs, history and science. For writers of non-fiction, send a query letter and proposal via email. An agent at Liza Dawson Associates, Monica is interested in every aspect of book creation and publishing. A local supporter of book stores and sellers, she knows the need for great writers and stories. Her constant efforts to promote authors from diverse backgrounds and races are inspiring. Some of her clients include Mia Mercado, Sharee Miller and Morgan Jerkins to name a few. Monica is looking to acquire literary fiction, non-fiction, relationships, humor, lifestyle, popular culture, business, biography, memoir, narrative non-fiction and politics. Write a query letter pasted in the body of an email to Monica. Radio, advertising, research, Melissa Flashman has dabbled in various fields. Her heart and soul lay in publishing and she became an agent at Janklow & Nesbit Associates. Previous employers include ICM, Trident Media Group and they allowed her to learn the ropes of the publishing world. Her authors have won awards such as Hugo Award, American Book Award, National Book Critic Award to name a few. To her, the author’s wishes and ideas come foremost. Melissa’s focus remains on getting the right author published in the right format. Journalists and short form writers can work with her to get published in magazines, newspapers or essays. Her ideal choice of genres and books include literary fiction, journalism, science, non-fiction, business, commercial fiction and technology. To submit your work to the New York based agency, read the submission guidelines mentioned on this page. Since 1989, Jim Levine has been running his literary agency Levine Greenberg Rostan Literary Agency. A teacher, Fulbright scholar, PhD holder, educator and author, Jim has massive experience and knowledge on his side. His days of juggling various careers and writing 7 books have given him the tools to teach new writers and authors how to take the first step. Jim isn’t impressed easily and he also knows the only way to succeed is through determination and hard work. Despite running his own agency and being a popular agent, he has time to commit to his authors and give them the support they demand. A writer is only as good as his agent and Jim’s client roster is full of eclectic and successful names. He is known to prefer topics such as business, health, spirituality, parenting, political issues, parenting and psychology. You can read the submission guidelines and submit a query through their form or via email. Founding partner and literary agent at Marsal Lyon Literary Agency, Jill has been in the business for nearly 15 years. A lawyer, editor and now literary agent, Jill has reached to the top of her field. Her experience as a lawyer has led her to being an excellent negotiator and her clients are grateful for that. Original characters, voices and stories intrigue her and journeys that seem challenging make for superb reading. She is trying to find authors and writers of women’s fiction, romance, historical fiction, mystery, thrillers, suspense, non-fiction, health, self-help, business, parenting, history and science. Send a query letter via email with the word ‘QUERY’ in the email’s subject line. An independent literary agent, Malaga Baldi runs her agency called Baldi Agency. Since 1986 she has worked relentlessly to take hidden gems, rough voices and polish them. Eager, amateur authors have worked with her and become successful professionals in the publishing industry. Her rapport with her clients is one of friendship, creative partners and a support system. They know that Malaga will guide them in the right way and give them the push they need to succeed. Her contribution to supporting and championing diverse voices, LGBTQ authors and literature has been applauded and awarded by several institutions. Submit your query to the New York based agent after reading the guidelines mentioned here. 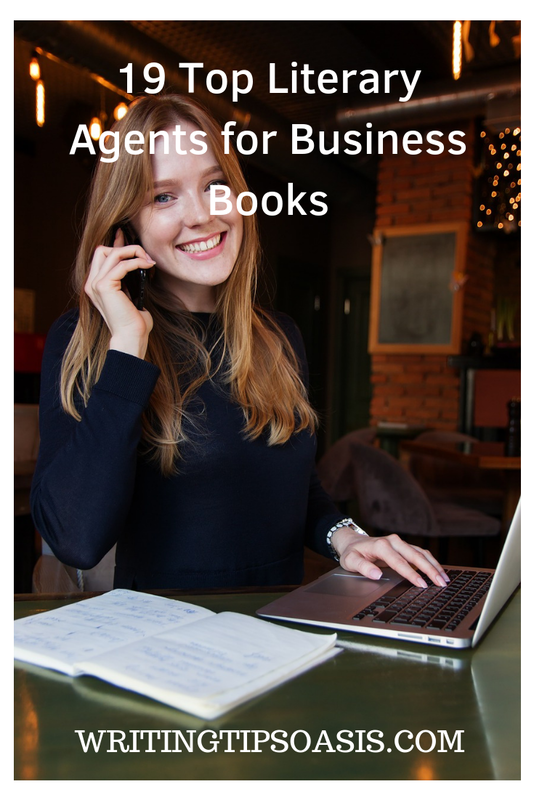 Are you aware of any other literary agents for business books? Please tell us about them in the comments box below!